Workshops are a fun and engaging way to increase science and wildlife education skills and background. Each participant receives a curriculum guide (Project WILD, Project Aquatic, Science and Civics, Growing Up WILD or Alaska Wildlife Curriculum) and a host of materials and additional resources provided by ADF&G. Workshops are taught by our staff or trained facilitators. Some workshops are available for graduate credit (for teacher recertification) through the University of Alaska system or Alaska Pacific University. There may be a materials fee as well as a fee for the graduate credit. Workshops can vary in length from 2–15 hours depending on the topic or if credit hours are required. ADF&G offers courses designed to give teachers more depth in background information and knowledge. These workshops are targeted at specific grade levels and curriculum frameworks. While workshops include Project WILD, Alaska Wildlife Curriculum, the focus is on providing background content information for teacher readiness. These courses are available to classroom teachers, para-professionals and other educators. Workshops are focused on scouting situations with adaptations for varying group sizes and environments. 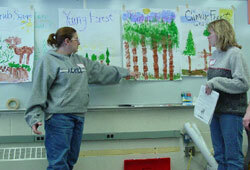 ADF&G offers training to people interested in becoming facilitators of the Project WILD and Alaska Wildlife Curriculum. With this training, volunteers can deliver teacher workshops with the support of ADF&G for materials, curriculum and logistics. Workshop fees vary according to the type and length of training being offered. The University system also charges a tuition fee for graduate credit.